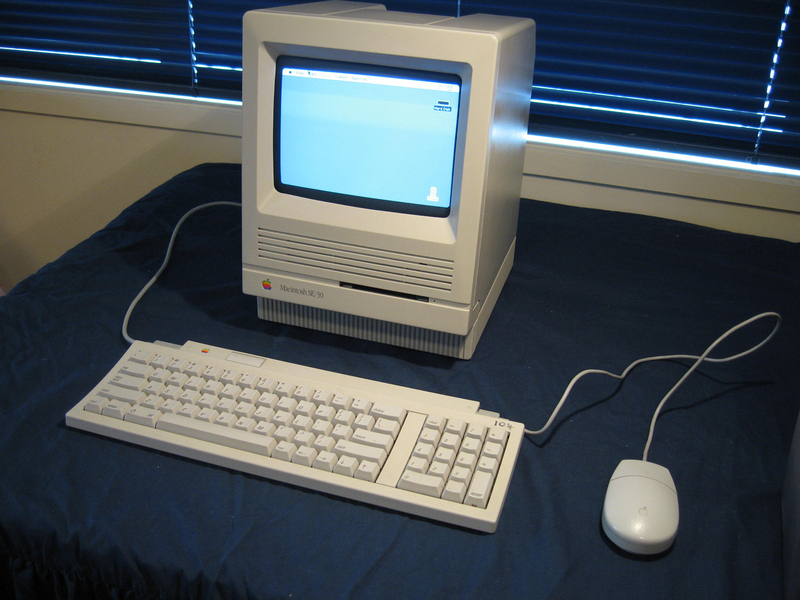 Appearing on the scene in 1989, the SE/30 (a significant upgrade to the SE series) continued the clan of Macintosh into early 1990. By the time this model had arrived, the graphical user interface popularized by its predecessors was well-accepted and developed (MS-DOS machines were still playing catch-up). The SE/30 was one of the most powerful of the "baby Macs". The fast 16 MHz, 68030 Motorola processor and 40 MB hard drive gave it plenty of grunt when needed. Network-capable and expandable, this model found some employment not only in desktop publishing (which Macs were famous for), but also in the server market. Like a few of my units, this computer had problems when it first arrived. In this case it was a non-functioning floppy disk drive. Access to this drive for cleaning was not easy requiring a near full disassembly! When I eventually got there, I found the drive was completely clogged with dustballs. Apparently this is common in these machines. The PSU fan creates airflow (as it should) but much of the air is sucked in the open drive. Over time dust accumulates. The drive is now cleaned and works. I even gave the machine an upgrade to OS (7.1) at the same time. However after doing this I found the existing 2MB of installed memory just wasn't enough to manage those large programs. After a memory upgrade the old fellow now sits far more comfortably with 16MB. In a recent workout I found that leaky capacitors were causing issues so these have been replaced. The only remaining annoyance is that occasionally the screen will flicker. I strongly suspect dry solder joints on the video board (a very common problem) so at some point in time I'd resolder there. One of the more sought-after Baby Macs and so a valued item in the collection.